Umno still popular with Malays, but will PAS be enough? The United Malays National Organisation or Umno – the only political party that defends the Malays and Malay language but has an English name in Malaysia – is still very influential among the Malays. But the question is whether its strength, added with the Islamists, are sufficient to win it the next elections? 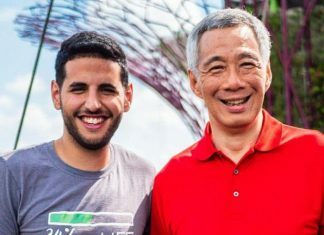 According to a survey by the opposition-led political and social analyst firm Invoke, the Umno is still a powerful political party in the country and still have the love of the Malays. 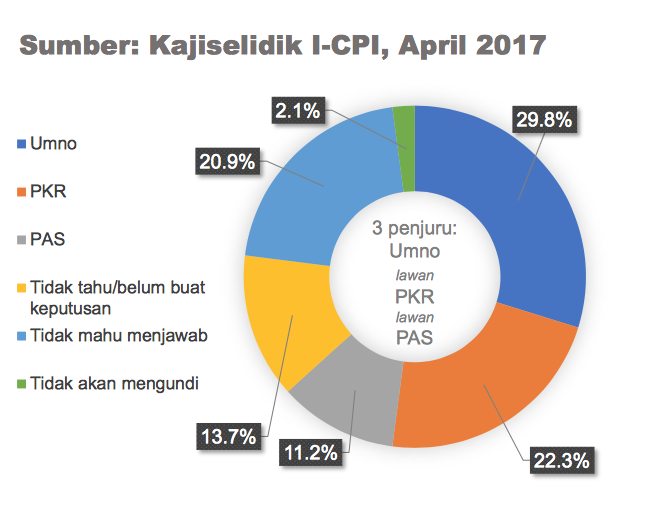 A graph published on Rafizi Ramli’s blog shows Umno with 29.8% of support, while the opposition party Keadilan has 22.3%. And in a three-cornered fight, the Islamists from the PAS will probably garner 11.2% of popular votes. With the PAS ready to play havoc with the opposition voters, entering a three-cornered fight against the Pakatan and the PKR, it will surely give Umno the edge if the situation remains the same. But there is also the votes from the Chinese community and those from the newly formed Bersatu of former Prime Minister Mahathir Mohamad and the Amanah which is a splinter group from the PAS. The survey did not mention whether the PKR tally were inclusive of the Bersatu and Amanah support. However, a survey commissioned by some of Parti Pribumi Bersatu Malaysia’s (Bersatu) founding members found PAS to be the most popular party as at the middle of last year, surpassing even BN. The face-to-face survey of 3,000 respondents found 44.4 percent expressing support for PAS, compared to BN’s 36.2 percent, and PKR’s 25.9 percent. No indication though whether the Bersatu survey was done among Malays only. Nevertheless, with Invoke’s survey, we can see some 35% of the respondents saying they did not decide who they will vote or they have an idea but refused to comment which side they supported. On the grounds though, the Malays are seen flocking to the Bersatu rallies, as was the case in Kampung Baru, Kuala Lumpur where thousands attended the last segment of the campaign by Mahathir’s party in that part of Kuala Lumpur. The atmosphere was one reminiscent of the ‘reformasi’ days in the late 1990’s. If there is such a groundswell of support for the opposition parties, then it appears the 41% the Umno-PAS de-facto alliance could bring to the Barisan would not be sufficient. They will need to dig further in the Malay townships and villages to garner the 9% they would need to at least hold the opposition at bay.